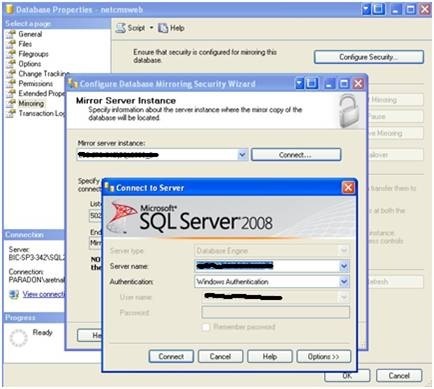 - Ensure that SQL Service /SQL Agent Services on all the machines start with the same domain account, otherwise mirroring wont work. 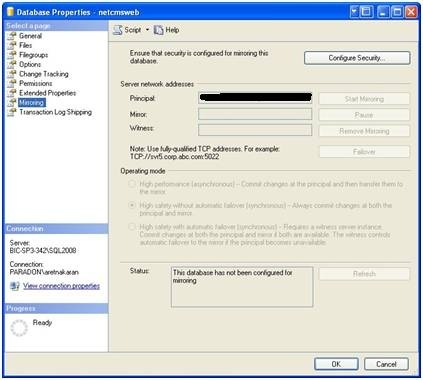 In order to get the database onto the mirrored server, we do a full backup of the ‘YourDatabase’ database on the Principal server, followed by a backup of the Transaction Log. 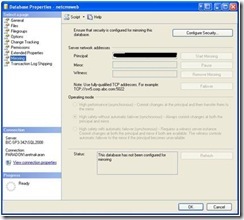 Copy the backup files to the Mirror. 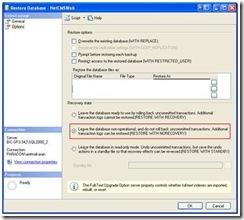 Perform another restore of the Transaction Log, also with the NORECOVERY option. (This is important; otherwise you'll get an error when starting the mirror). 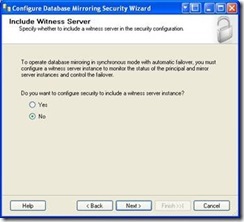 You'll notice that the database on the Mirror server now is marked as "Restoring..." and can't be accessed. This is normal and expected! 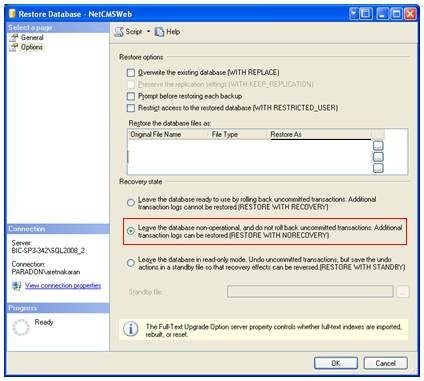 The Mirror is always in a permanent Restoring state to prevent users accessing the database, but will be receiving synchronization data. If the database fails over to the Mirror, then it will become an active database and the old Principal will go into the Recovering state. 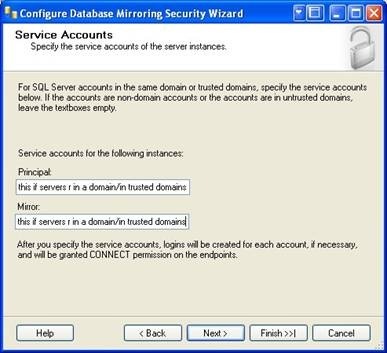 Make sure that the sql/ sql Agent services on both the principal and the mirrored servers are running under the same local user account and not Local system account. 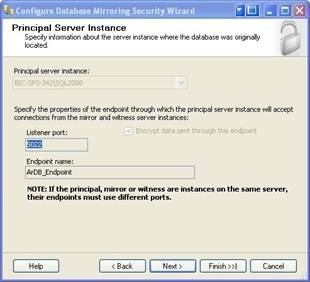 Create a local user on both the Principal and the Mirror server with the same username and password. For example, "sqluser". 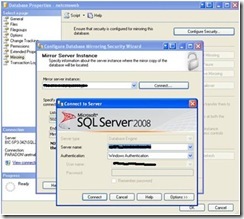 ***Create a SQL Login on both SQL Servers for this user you created. Now it is time to setup Mirroring. 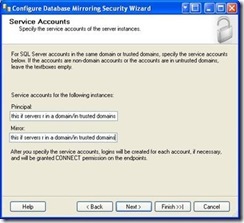 In the Mirror Server Instance stage, choose your Mirror server from the dropdown and click Connect to provide the credentials. Click Next. 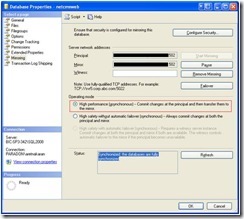 Change the operating mode to “High performance (asynchronous)”, otherwise the principal database will become slower. 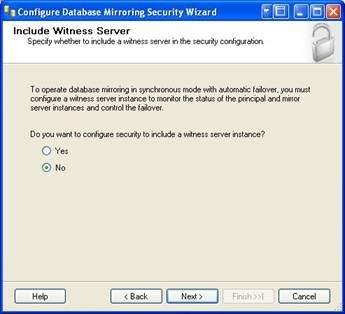 The mirror should then start, and within moments, the Status should be "synchronized: the databases are fully synchronized"